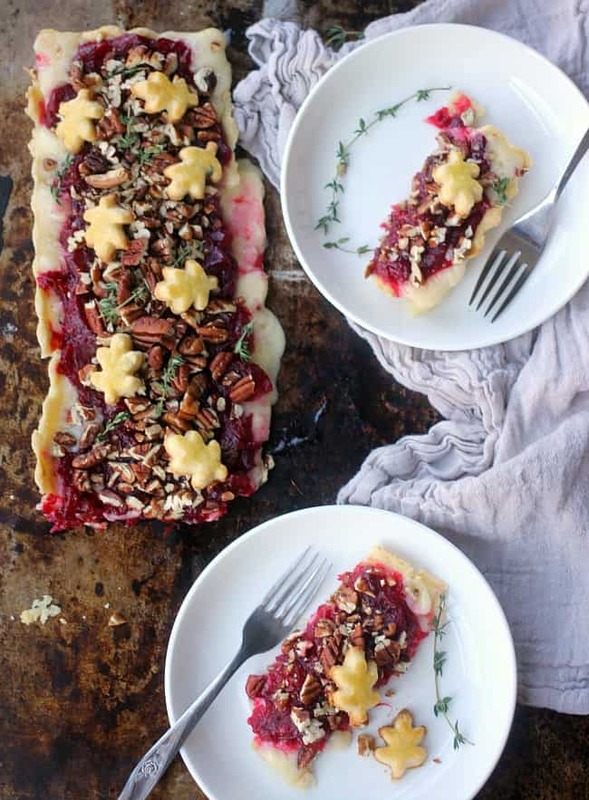 This Brie Cranberry Tart with Thyme and Pecans is a unique take on a Brie en Croute! Serve this as an appetizer or a dessert to your holiday meal. It is sure to impress a crowd. I don’t know about you, but sometimes I just want something a little more fancy to go along with the traditional Thanksgiving Day feast. Something to munch on while the rest of the meal is being finished and guests are still arriving. I love plan for something festive and beautiful to set the tone of the day. I have made a brie en croute with a cranberry filling the last few years, but this year I wanted to try something just a little different- a take on brie en croute with a more fun and cheerful feel to it. What I love so much about this Brie Cranberry Tart is that the components can be prepped before the day of. It is wonderful served at room temperature or warm if you do have the oven space and time to get it that way. And really, this could be an appetizer or a dessert. I am a huge fan of cheese as dessert and this would be lovely after all the hearty turkey, gravy, potatoes, and stuffing. 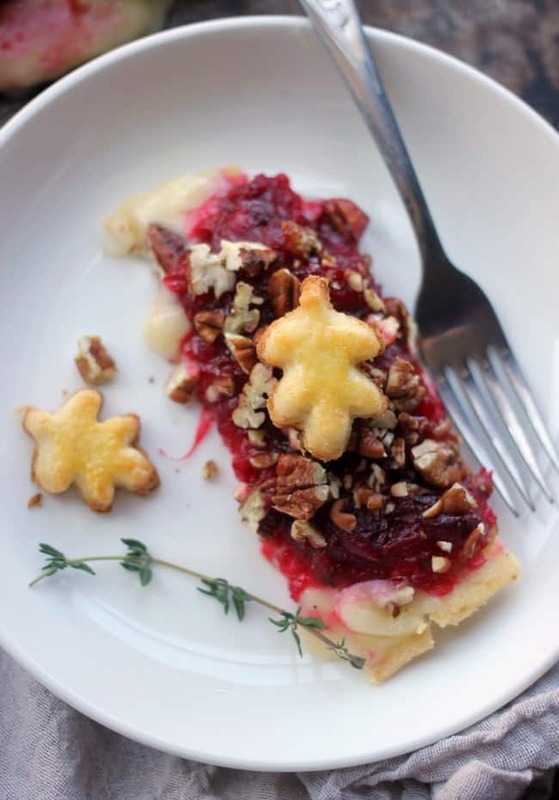 There are 3 simple steps to prepare this brie cranberry tart: Prepare the cranberry relish, prepare the crust, and assemble and bake! I love to make the relish and the dough for the crust far in advance. They can both be made up to a week ahead of time and just kept in the refrigerator. This way on the day of serving, all you have to do is assemble. I am very in love with this cranberry relish. It is beautiful on its own even if you don’t want to make the tart or you could serve it more simply over some warmed brie as well. Place all of the ingredients for the cranberry relish in a medium saucepan over medium heat. Cook, stirring frequently, until the cranberries pop and the relish thickens. This component can be made up to a week ahead of time and stored in an airtight container in the refrigerator. Whisk together the egg yolk and water in a small bowl. In a medium bowl, whisk together the flour, sugar, and salt. Add the pieces of cold butter into the flour mixture and cut it in with a pastry cutter or fork until it is the texture of coarse meal. Gently stir in the egg/water mixture until a dough begins to form. It will look shaggy. Roll out the pastry on a lightly floured surface to about 1/4" thick. You don't want it too thin or it won't be sturdy enough to hold the brie. Press the pastry into a 14" x 5" rectangular or 9" circular tart pan and trim the edges. Place the pastry lined tart pan in the freezer for about 10-15 minutes to set. Meanwhile, preheat the oven to 350F (177C). Line the tart with parchment paper and fill it with pie weights, dry beans, or rice. Bake at 350F (177C) for 20-25 minutes, until browned and well set. If desired, use the scraps of the pastry to cut out decorative pieces for garnish. Brush the pieces with a whisked egg and bake at 350F (177C) until lightly browned, about 10 minutes. Cut the brie into thin slices and lay them evenly into the tart crust. You can choose to leave the rind on or cut it off. I chose to cut it off. Spread the cranberry relish evenly over the brie. If the relish is particularly juicy, you can drain off the excess liquid before doing this. It should be fairly thick. Bake the tart at 350F for 20 minutes, until the brie is melted and the relish is bubbly. You can do this the morning of and let the tart sit at room temperature. Remove the tart from the tin and top with chopped pecans, decorative pastry pieces, and fresh thyme sprigs if desired. What is the third item under “Assemble”? Thanks. Hi Candace! It is chopped pecans! Thank you so much for pointing that out. I have updated the recipe! Hope you enjoy the tart!